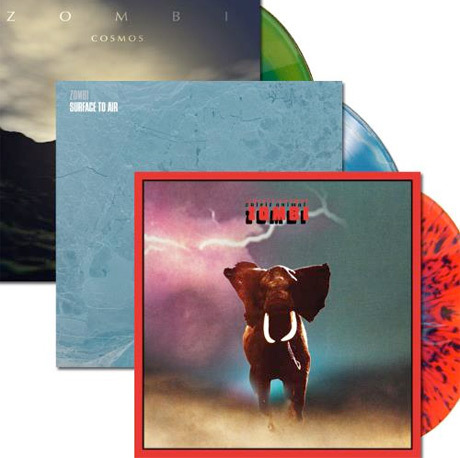 It truly is the day of the dead, as U.S. synth-creepers Zombi have announced they're about to unearth a few old LPs in a deluxe vinyl reissue campaign. A press release confirms the Pittsburgh duo and Relapse Records have plans to reanimate 2004's Cosmos, 2006's Surface to Air and 2009's Spirit Animal on January 7. Cosmos, of which Exclaim! praised for its "darkly ambient soundscapes" inspired by John Carpenter and Goblin scores, will be served up on double LP for the first time in almost a decade, while Surface to Air will gets its first-ever North American pressing. The reinvigorated Spirit Animal comes as a gatefold double LP, and now includes the bonus cut "Infinity." Pre-order are being taken over here. Fittingly, the duo's first tour in seven years gets underway next month with their heroes Goblin. Though none of these shows take place in Canada, you'll find the info down below. In related news, Zombi's Steve Moore will issue his next solo set, Pangaea Ultima, on December 16 via Spectrum Spools.